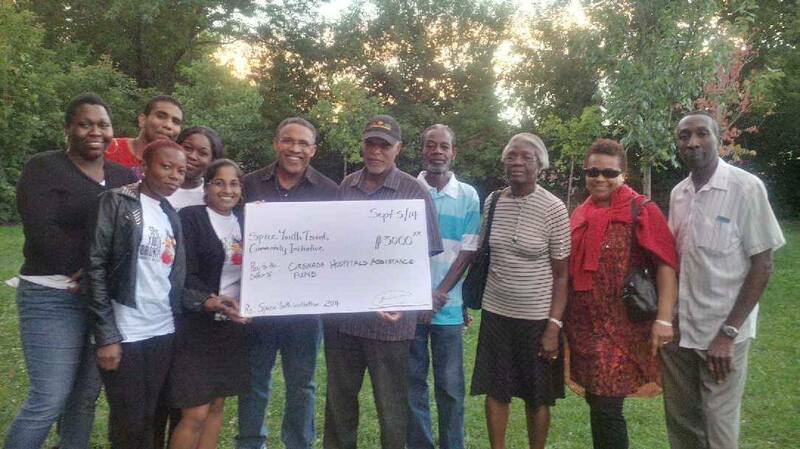 Toronto, Canada – September 18, 2014 – On Saturday September 6th, members of Spice Youth Toronto Community Initiative (SYTCI) handed over a cheque worth $3,000 to the Grenada Hospitals Assistance Fund (GHAF). The funds represent the proceeds of the first Spice Youth Walkathon hosted on behalf of the GHAF on July 20. Titled ‘One Community. One Goal. Better Healthcare’ the goal of the event was to raise funds and awareness to support the delivery of better healthcare in Grenada. The funds will be the first contribution to the GHAF’s ‘Special Equipment Fund’ set up to facilitate the purchase of specialized medical equipment for Grenada. Items include an Ultra-sound machine for the Princess Alice Hospital and an Anesthesia machine for the General Hospital. The goal is to raise $20, 000 by the end of 2015. The gem for this idea was born at a SYTCI general meeting in 2013, when members expressed deep concern for the state of healthcare in Grenada. Through subsequent discussions, a decision was made to select the GHAF as the recipient of our annual charitable efforts for 2014. The GHAF, a Grenadian charitable organization based in Cambridge, has a mandate to support the delivery of better healthcare in Grenada through the purchase of medical equipment and supplies, hence the selection. In thanking the organization, President of the GHAF, Mr. Mansfield Lambert indicated his deep appreciation for the work of the members of SYTCI in championing this cause and pledged to continue working for the betterment of Grenada. Persons wishing to donate to the cause can still make a donation online at http://www.chimp.net/give (search Spice Youth).